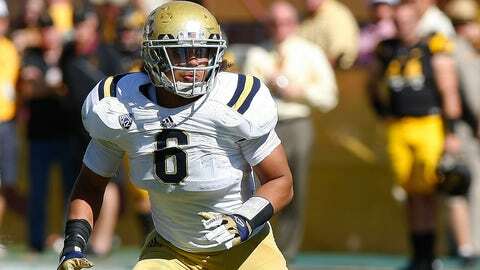 Eric Kendricks leads the team with 106 tackles, third most among Pac-12 players this season. LOS ANGELES – Linebacker Eric Kendricks has struggled since spring practice with an ankle injury and finally succumbed to the constant pain he has been playing in. UCLA head coach Jim Mora reported that Kendricks underwent surgery on the injured ankle Friday, leaving the Bruins without their leading tackler for the Sun Bowl. "There was kind of a lot of back and forth on whether or not he should get it done and the general consensus was that he needed to get it done sooner rather than later," Mora said, following the team’s final bowl practice in Westwood. "He’s really sad to miss the bowl game but it was just extremely painful for the kid. He just would have been effected so the best thing to do was just go get it done right now." Kendricks was in a boot through most of spring dealing with the injury and has pushed through the ankle and a myriad of other small injuries throughout the season. But despite missing some playing time, the redshirt junior still managed to record 105 tackles (four for loss) and two sacks, finishing as the Pac-12’s third-leading tackler. The loss is bigger than just physical, Kendricks is a captain and defensive signal caller. One of the most passionate Bruins on the field, Kendricks only comes out of games when the training staff mandates it and was beside himself when he was unable to finish out UCLA’s game at Oregon. "We’ll certainly miss him. Heck, he’s our leading tackler," Mora said. "It’s been really kind of off and on, bothering him since (spring). It just got progressively worse as the year went on, he’s been kind of fighting through it, that’s the kind of kid that he is, and eventually it became too much." Isaac Savaiinaea will be the replacement once again. The freshman played in 11 games and was impressive, recording 24 tackles and one for loss. Mora is confident that the combination of Savaiinaea and Myles Jack in the nickel package will be effective enough to stop Virginia Tech’s spread looks. "He doesn’t have the experience of EK and that hurts on occasion but Isaac is a very mature freshman," Mora said. "He’s not overwhelmed by this game at all, it’s not too big for him. He just plays."